After having met God at the foot of Mt. Sinai, the Israelite nation is presented with an array of laws that will guide them in creating a just and decent society, in response to which they say “Na’aseh v’nishmah…we will uphold them and we will contemplate them.” The Israelites affirm that, with regard to the Torah, they will not only “talk the talk,” but they will “walk the walk.” They seem to recognize that one’s support of an idea must not be theoretical, but must be reflected in action. The best way to demonstrate commitment to an ideal or a cause is through one’s deeds. What’s needed now is for the new prayer space to be used regularly. Nothing will be more damaging to the cause of Masorti Judaism in Israel than for the non-Orthodox section of the Kotel to be empty on a routine basis. If you’re visiting Israel, make it a point to daven there, whether or not you’re attending a special simcha. And I urge you to become an active supporter of the Masorti Movement. Learn what the Masorti Movement in Israel is doing to connect Israeli Jews to Judaism. To discover what the Masorti Movement is all about, visit www.masorti.org. Na’aseh v’Nishma…support for important ideals must be expressed in word and in deed. This week, the Israeli government put their muscle behind that statement. So must we. Note: Would you like to explore the richness of the weekly Torah portion? Would you like to discover how there is something to learn about how we live our lives from each of its passages? For several years I’ve been teaching a weekly class on the Torah portion. Beginning in March, that class will be offered twice on Mondays—once in the morning (9:00 AM) and one at night (8:00 PM). I hope you’ll be there to share in the discussion and to contribute your ideas! Is the Iran Nuclear Agreement a good deal? Truth be told, I’d have to say that I’m not sure. On the one hand, even with sanctions in place over a period of years and word that the Iranian economy was on the verge of collapse, they were still reportedly only a couple of months away from having enough nuclear fissile material to build a bomb. Even with tough sanctions in place, they were still able to build, and protect, complex sites where uranium was being enriched. So I’m inclined to think that any agreement that puts limits on Iran’s ability to develop its nuclear program is a win for those who fear what would happen if they actually had an arsenal of nuclear weapons. True, the inspection protocol agreed to seems weak and insufficient, despite claims that it’s “airtight.” And I fail to understand why there is a sunset clause on the agreement. As one observer put it, all the Iranians have to do in order to acquire a nuclear weapon is to be patient. The answer some have given to that quandary, that 10-15 years is at least something, seems quite lacking to me. On the other hand, it seems that the agreement lets a wild animal out of its cage and makes it stronger. The agreement completely overlooks the fact that Iran is the world’s leading state sponsor of terrorism, and that the lifting of sanctions will accomplish the goal of funding Iran’s terror machine. Even if they spend four out of five dollars available from newly found money on rebuilding infrastructure in their country, that would still leave tens of billions of dollars in the hands of the Republican Guard, the secretive arm of the Iranian government that is responsible for terrorist activity around the globe. As an ardent Zionist and supporter of the State of Israel, I cringe at the way Iran will feel newly empowered to cause trouble for Israel. There is strong reason to believe that they will strengthen Hezbollah, make their missiles (really, Iran’s missiles) more lethal, and possibly open a second front against Israel from Southern Syria. My assessment of whether or not the agreement is good is based on whether Israel is more or less at risk as a result of it. And I am inclined to think that Israel is more threatened because of the Iran Nuclear Agreement. I have to decide soon whether or not to urge my representatives to oppose the agreement when Congress votes on it. And so do you. Whether we favor or oppose the agreement, as Jews and supporters of Israel we certainly cannot be apathetic or indifferent. What we need to make a decision is clear information, accompanied by robust discussion and debate. Toward that end, I’ve invited Matan Shamir, Executive Director of United Against Nuclear Iran, to speak to us at “Tapas and Torah” this Friday night (service at 8:00 PM, Tapas and presentation at 8:30 PM). Mr. Shamir and his organization may be against the Iran Nuclear Agreement, but I have spoken with him about the need for objectivity. He will not speak as if he is on a mission to persuade us to oppose the deal. He will not skew the facts toward his position. He will lay out why those who support the deal hold that view, and why those who oppose it do so. He will make suggestions for how the deal could be improved from his perspective. He will take questions and answer them objectively. I urge you to be at Oheb Shalom this Friday evening, not primarily for the tapas of course, but for the opportunity to learn and discuss a truly crucial and momentous decision facing us as Americans and as Jews. We should all be aware of and concerned about two violent and tragic incidents that took place in Israel last week. The first of these incidents took place a week ago at Jerusalem’s annual Gay Pride Parade. In a region where gay rights are unheard of and where tyrannical leaders openly deny the existence of homosexual people living in their countries, Israel is a beacon of tolerance, freedom and inclusion. Despite the fact that the city’s ultra-orthodox Jews deem homosexuality to be forbidden by Jewish law (as do many mainstream Orthodox Jews around the world), Judaism’s holiest city holds an annual Gay Pride parade. At this year’s parade, a deranged man, Yisshai Schlissel, stabbed a 16-year old girl, Shira Banki, who was marching in the parade. She later died of her wounds. Making the incident even more outrageous, Schlissel had just been released from prison where he served a 10-year sentence for assault on another gay person (an investigation is now underway as to why Schlissel was released only two weeks prior to this year’s parade, apparently setting in motion another act of assault). The second incident, perpetrated by Jewish extremists affiliated with a group known as “Tag Mechir” (Hebrew for “price tag” and referring to the “price” to be imposed after a Palestinian act of terror is committed against Israelis), involved someone firebombing a Palestinian home in Duma, near Nablus. This horrendous act of violence caused the death of an 18-month old baby asleep in the home, and serious injuries to the baby’s 4-year old brother and parents. Spray painted on the home was the Hebrew word “Nekama” (revenge), signaling the attitude and intentions of these cowardly criminals. The two incidents are not identical, for one was committed by a person who is surely deranged (he is now being examined to see if he is fit to stand trial). What they have in common is that, in both cases, the perpetrators believed they were upholding the teachings and values of Judaism. In the aftermath of these two horrifying incidents, Israeli officials are slowly turning their attention to the ugly phenomenon of Jewish terrorists. Defense Minister Moshe Ya’alon approved detention without trial for an individual being questioned about the incident, and Isaac Herzog, head of Machane Tzioni (the Labor Party), posted on his Facebook page that Jewish terrorists should suffer the same fate as Arab terrorists, including home demolitions and long prison terms. These gestures are reasonable and appropriate, though they are viewed by many in Israel as too little, too late. Israel has long overlooked the problem of Jewish terrorists and now has to act quickly to defeat those who act violently in the name of Judaism. Indeed, anyone who is a Zionist, wherever they may live, must denounce these horrible acts as cowardly and unbecoming the values of the State of Israel. But these acts are more than unbecoming the values of the State of Israel. They are entirely un-Jewish. The people who firebombed the home of a Palestinian family, killing an infant and endangering the lives of his parents and brother, did what they did not only because they are extremists who wanted to rid the land of Palestinians and punish innocent people with a sick act of revenge. They are supposedly religious Jews, people who pray regularly, who think they are following God’s commandments, people who keep Shabbat and the holidays, who study in Yeshivot and learn Torah. I can say, indeed we all can say, that these people are utterly unrecognizable as Jews. This wasn’t an instance of someone committing a sin for which repentance is required in the hope of forgiveness (though what was done was surely sinful). Their acts represented a Jew distorting the teachings of Judaism in order to justify violence and murder in the name of Judaism. We must recognize that there are Jewish terrorists living in the State of Israel who believe that acts of violence are appropriate and even justified by the Torah. We must denounce such acts of violence, and prosecute those who commit them to the fullest extent of the law. And we who cherish Judaism, who respect its teachings and who love the Torah, must stand up to say that no one, ever, may commit an act of violence for the sake of revenge and call that act Jewish. For there is nothing about such an act that is even remotely akin to the Judaism that we know and love. While here in Israel visiting Josh and Yoni, I participated in a day long visit with Palestinians sponsored by Encounter. Encounter’s mission is “to provide Jewish Diaspora leaders from across the religious and political spectrum with exposure to Palestinian life,” and “to create human connections across lines of enmity, and expand personal and political understanding.” Encounter is not a political organization and does not take a position on the Israeli-Palestinian conflict. Rather, they aim to create understanding if not agreement. After a long day of conversation, it’s clear that the Israelis and the Palestinians each have conflicting truths and conflicting narratives of the conflict they have endured for decades. Any chance of resolving the conflict requires these narratives to be set aside and both sides to pay attention to the needs and concerns of the other. It’s also clear that there’s no easy solution. Having listened to six Palestinians offer their insights, I am left with feelings of both fear and hope. I fear that the conflict can’t, and won’t, be resolved anytime in the foreseeable future, and I hope that both parties will find the courage, and identify the leadership necessary, to move toward reconciliation. What follows is a summary of what I heard today in Bethlehem. 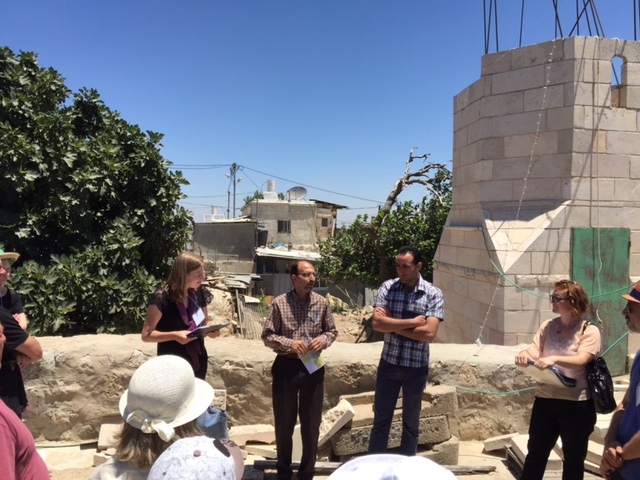 After an orientation at a local hotel here in Jerusalem, the group I was a part of traveled by bus to the Bethlehem region, to the home of Ali Abu Awwad. Ali runs an organization called Jubur-Roots, whose mission is to develop and empower non-violent leadership in the Palestinian community. Ali, a man in his late forties, was raised in a politically active family with strong ties to the PLO and, as a younger man, was personally involved in what he calls “resistance against the Israeli occupation.” He was arrested and imprisoned, though he did not elaborate on exactly what he did to get arrested. Did he throw a rock or a Molotov cocktail at a tank, or did he participate in a kidnapping or killing? Ali was never able to imagine the pain of Israelis who were victims of Palestinian violence. 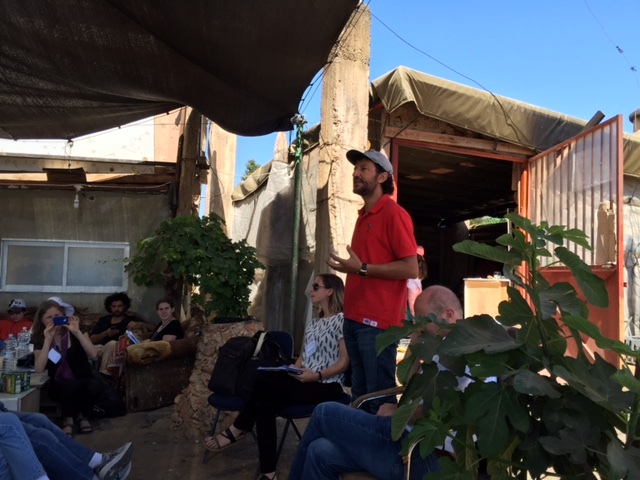 However, after he met and talked with Israelis who had lost someone to the conflict, he founded Jubur-Roots and today works to build a movement of Palestinians who seek a non-violent approach to conflict resolution. Ali sponsors regular dialogue with settlers and seeks to foster a deeper understanding of each side’s pain and fear. Through dialogue he hopes to lower the volume on what he calls “the security myth” and build a shared vision of what justice would look like in this region. He talks openly about the corrosive effect of occupation on both sides. He told a story about waiting for two hours to get home at a check point in the West Bank during a cold and driving rain. When he finally reached the check point, Ali relates that the soldier asked him, in a tone he regarded as sarcastic and cynical, “How are you?” Ali answered, “I’m fine. Not only am I dry and warm inside my car, but soon I’ll be home with my family and you will still be standing here at this check point making all these people suffer.” Ali suggested that his response to the soldier put a human face on the ugly routine of making people wait countless hours through check points, and he spoke of the need to understand each other’s suffering. Ali acknowledges that the Palestinian community also suffers because of internal divisiveness, political corruption, and a great divide between the idealism of non-violence and the reality of incompetent political leadership. Hamed Qawasmeh, originally from Hebron and raised in Kuwait, today lives in Hebron. He earned a Master’s degree in political science at Idaho State University and a Master’s in Business Administration at Bar Ilan in Israel. Hamed works for the UN Office of the High Commissioner on Human Rights and is an active member of the Israeli-Palestinian Villages Group. Hamed talks about how the area in which a Palestinian state could be developed is rapidly shrinking due to the creation of military zones and nature reserves, closures that create isolated pockets of habitation, the denial of building permits and the threat of demolitions, and the pathway taken through Palestinian villages by the separation barrier. Using maps and statistics, he makes a compelling case that the current approach is rapidly making an independent Palestinian state impossible. But Hamed’s commentary seems less than objective at times. He uses phrases like “the settlement of Gilo,” referring to a thriving town on the outskirts of Jerusalem next to Bethlehem that, by all accounts, would remain part of Israel in any future agreement. He speaks cynically about how the Israelis restrict Palestinian access to water resources, depicting the Israelis as lacking compassion and creating a desperate situation that chokes off agriculture and normal living standards, but there is a sense that his take on the matter is quite one-sided. When asked to explain the fact that violent attacks against Israelis by Palestinians decreased dramatically after the creation of the separation barrier, Hamed answers that the drop in violence resulted not from the wall but from a new attitude among Palestinians that violence is not an acceptable pathway to take. When asked why the population of Christians has decreased in Bethlehem, Hamed answers that Christians were not persecuted by Muslims and forced to leave, but made a choice to leave seeking better economic opportunities in other countries. Hamed was asked if he blamed the Palestinian political leadership, specifically Yasser Arafat, for turning down the offer made by the Israelis 15 years ago to establish a Palestinian state on nearly 96% of the land in the West Bank in a deal that did not include Palestinian sovereignty over East Jerusalem. He answered that Arafat felt he could not accept a deal that did not include Jerusalem because, not being a religious leader, he felt he was not in a position to speak on behalf of Muslims around the world. So he consulted with the president of Egypt and the King of Saudia Arabia, both of whom indicated that the deal should not be accepted. I asked Hamed if he would accept the same deal today if Israel were to make the same offer and he immediately answered that he would not, adding that any deal that does not include Jerusalem is unacceptable to Palestinians. He views negotiations based on the pre-1967 borders as representing a massive compromise on the part of the Palestinians and does not think any further compromise is called for. I asked Hamed if he acknowledges the validity of Israeli security concerns and whether or not Israel has any reason to be concerned about relinquishing control over the West Bank. He immediately related his view that a Palestinian state would be fully capable of keeping the peace. Hamed does not believe that there will ever be an independent Palestinian state, but he greatly values the daily cooperation and support provided by the Israeli-Palestinian Villages Group through which he can bypass the bureaucracy of the military administration of the West Bank and simply obtain some of the services he needs for Palestinian villages. Sam Bahour, a Palestinian-American business consultant who lives and works in Ramallah, spends his time helping Palestinians to develop businesses in the West Bank. He spoke openly about the destructive effect of occupation on creating a thriving economy in the West Bank, and his view that encouraging business development is a non-violent means of resistance. He feels that the occupation is like “a boot on the neck of the Palestinians.” Like Hamed, he views the Palestinian position of establishing a state based on the pre-1967 lines as a significant compromise, and cannot imagine accepting any deal that does not relinquish control of East Jerusalem, including the Temple Mount and the Kotel, to the Palestinians. I asked Sam if he felt that the sole cause of Palestinian resistance is the Israeli occupation, or if Palestinians and the Arabs reject the very idea of Zionism. He answered that, without doubt, Arabs reject the idea of Zionism, telling me that “there’s Judaism, Zionism and Israel, and there’s a reason there are three separate words used for each idea.” He claims that Zionism is an ideology which Arabs need not accept, that Judaism is a religion and that Israel is a political entity with which they must contend. 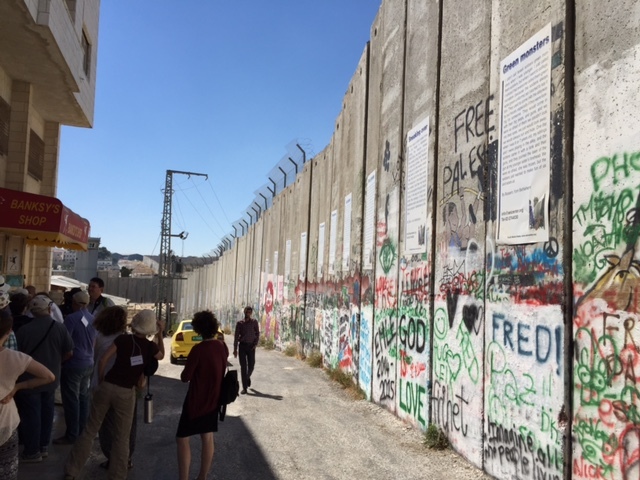 Without doubt, all of the presentations I heard on my Encounter reflected a Palestinian perspective. There was no discussion of Israel’s security, concerns that Hamas militants would rapidly supplant Fatah leadership in the West Bank in any future Palestinian state, turning the area into an armed terrorist training camp and launching pad for routine attacks against Israel. There was no mention that removing check points or the security barrier would likely result in the regular movement into Israel of terrorists wearing suicide vests with the intent of blowing up civilians going about their daily lives (despite Ali’s commitment to non-violence). There was no discussion of a Palestinian education system that teaches children that Jews are inferior to other humans and evil, the demonization of Jews in the Arab press, the glorification of violence against Israelis, or the honoring of terrorist thugs with bonuses and streets named after them. My day long encounter with Palestinians stirred feelings of both fear and hope. The people I heard tell their stories speak of a grim reality faced by Palestinians and that the window of opportunity to change that reality is rapidly closing. The reality of a military occupation with no end in sight and continued settlement building undoubtedly have a corrosive effect on the soul of Israel and threaten the democratic nature of the state. Yet, there is hope that through grassroots dialogue the essential humanity of the Palestinians, the security needs of the State of Israel, and respect for each other’s narrative can emerge and take hold. I’ve just returned from being in Israel for a week, and I feel refreshed. I can’t claim to be physically refreshed, as, like most people, I tend to feel the effects of jetlag. But I certainly feel spiritually refreshed, which is how a person feels after spending time in Israel. My step quickens when I am in Eretz Yisrael, as I’m eager to get to places quickly. I see things with eyes especially wide open, as I’m eager to take in all the sites before me at once. My mind and heart are even more open, as I feel that I am enriched by the people I meet and the Torah I learn on the streets of Jerusalem. I always hope to gain some new insight when I’m in Israel. On this visit, I sensed a focus on the fact that this Jewish year is a Sabbatical, or “Shemita” year in the Land of Israel. One might think that observing the Sabbatical year would be one of those things that only the strictly observant do. Certainly, those who observe Jewish law strictly follow the laws of the Shemita scrupulously, as they do all other Jewish laws, both major and minor. On this visit, I could see that the notion of the Sabbatical has been embraced by a wide cross section of Israelis, including those whom we would consider “secular.” The Shemita year is impacting Israelis in numerous, interesting ways. There are educational initiatives being developed, social service projects being undertaken, and even children’s books being written, all inspired by the fact that 5775 is a Sabbatical year. To inspire gratitude – Observing Shemita can lead people to see the yield of the land as a precious, finite resource that must be appreciated. Indeed, the original intent behind the Sabbatical year may have been to remind people that we owe thanks to God for being able to harvest crops and put food on our table. Ask a child where a loaf of bread or a vegetable comes from and they’ll likely say the supermarket. The Shemita year urges us to give credit where credit is due. To encourage generosity – The Shemita year meant that there was less food produced, which hopefully led not exclusively to securing one’s own needs for food but to greater generosity and outreach to the poor. In modern times, especially in Israel, the Shemita year is sparking new initiatives to feed the hungry, and it should have the same impact on those of us living in the Diaspora. To increase environmental awareness – What if the land couldn’t produce sufficient food for the world’s population, or produce what we need at all? The Sabbatical year is sparking a necessary, broad focus on caring for the earth around us. Israel, long known for brilliant advances in agricultural technology, is discovering new ways to grow food efficiently and cheaply and, in the process, helping to solve the monumental problem of managing the potential of the earth to sustain all its inhabitants. To suggest personal renewal – Notice that the verses in our parasha link the Sabbatical year to the Sabbath (they are, of course, born of the same concept). By mandating that the land “rest” one year out of seven, the Shemita year urges us to seek personal renewal by resting on the seventh day. Nothing could be more logical or necessary for human beings. When God created the world, the seventh day was a day of rest. If God is all-powerful, why would rest be necessary? The answer must be that God wished to emulate to each of us that personal growth and continued creativity are the result of periodic, regular renewal. God wanted to model for each of us the practice of working for six days and resting on Shabbat. Throughout time, Shabbat has been a magical time devoted to family and communal gatherings, to prayer and reflection and, yes, rest. If you haven’t already adopted a personal practice of taking Shabbat off, use this Shemita year to begin (and be sure to include Oheb Shalom in your day of rest!). I had the privilege of being in the Land of Israel last week, and I came back inspired. This week’s parasha shows each of us how we can enhance our lives and those of others. That’s “food for thought,” in a manner of speaking, another yield of the Sabbatical year. I’m in Israel this week, visiting with my family and enjoying this beautiful country. I arrived at Ben Gurion Airport late Monday night and got into a “sheirut,” a shared taxi, for the ride to Jerusalem where I am staying. A sheirut is an inexpensive way to get where you’re going from the airport. Each vehicle seats 10 people and leaves only when it’s full. When you exit the airport, it’s common to be greeted by the driver asking if you need a ride to Jerusalem in a sheirut, or even by other passengers eager to depart. The disadvantage of traveling in a sheirut is that once it arrives in Jerusalem it makes stops along the way and your stop might be last on the line. But the advantage is the opportunity to meet new people and hear their stories. On this trip, the sheirut was filled with two Israeli businessmen returning from a trip to the USA, three Americans (including me) visiting Israel, and five ultra-Orthodox Jewish Israelis. The businessmen were clearly secular people who don’t wear a kippah or participate in any form of organized religious life. The two other Americans were Reform Jews from somewhere in the Northeast, affiliated with a synagogue but not practicing Jews. The ultra-Orthodox Jews were young men headed back to their families and their routines of study in the Yeshiva (I don’t know what they were doing abroad). I wondered what I have in common with my fellow passengers. Clearly, we have a common heritage. We share an identity of being Jewish, though the three types of Jews in the sheirut express their Jewish identity quite differently. I think I have a reasonably common language with the secular businessmen, and certainly much in common with the couple affiliated with the Reform Movement. On the other hand, the ultra-Orthodox lead a very insular life, virtually shutting themselves out from the influences of the outside world. It’s common for ultra-Orthodox Jews to prohibit watching television or connecting to the world through the internet (though most seem to use a cell phone for communication). The ultra-Orthodox stress the study of the Torah, the Talmud, the Midrash and the codes of Jewish law, while minimizing the study of secular subjects like math and science (the majority of kindergarten students in Israel are ultra-Orthodox, raising fears about the next generation of Israelis preparedness to continue Israel’s success in developing a technological society). There is little or no interest on their part in discussing the diversity of the Jewish world. I’m a Conservative Rabbi—what on earth would they want to talk about with me? I was curious about their lives and their values. But I was reluctant to strike up a conversation, mostly because I sensed no interest on their part to talk, a veneer of distance between us. What would I say? “Hi, I’m Mark Cooper, the Rabbi of Oheb Shalom Congregation, a place that practices Judaism in ways that you regard as sinful and a desecration of God’s name. How was your flight?” And what would they say to me? “So, how is the Triennial Cycle for reading the Torah working out for you?” We see the origins of Torah from vastly different perspectives, and we practice Judaism in vastly different ways. What do I have in common with the ultra-Orthodox? There is no doubt that the Jewish people possess great depth and diversity, a consequence of being exiled from the Land of Israel and living productively in the Diaspora (on this trip to Israel I saw a thrilling new exhibit at the Bible Lands Museum on the Jewish community that developed in Babylonia 2,500 years ago…but more on that in a future post). Can we create a unified whole out of the disparate parts? Do the various segments of the Jewish people see themselves as part of a greater whole? This week’s Parasha, Yitro, gives us a hint and some encouragement toward that goal. Spanning chapters 18-20 of Exodus, Yitro describes God’s revelation to the Israelites at the foot of Mt. Sinai, a foundational moment in our history. Rabbi Neil Gilman, one of the great Jewish theologians of our time, taught that all of Jewish theology and everything practical that flows from it, turns on how one interprets these passages of Torah. Early in chapter 19, we read that “Israel encamped at the foot of the mountain.” Interestingly, the Hebrew uses the singular form of the verb (he, not they, encamped). Rashi, the great medieval scholar, notes the odd use of the singular verb to describe a multitude of people, and says: “In that moment, the Israelites were united with one mind and one heart.” Apparently, the experience of meeting God united everyone. Can we make one out of many? Do we, progressive, Conservative Jews, have anything in common with the ultra-Orthodox? Do we have any common language? Is there such a thing as one Jewish people? Being here in Israel, observing this colorful, multi-faceted Jewish society, it’s hard to believe otherwise.